GRACE PLUS ONE: GRACE Quintuplets turn 4 weeks old and hit the Front Page!! 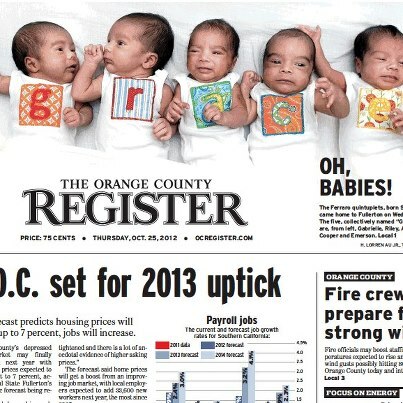 GRACE Quintuplets turn 4 weeks old and hit the Front Page!! We came home to a little fanfare after a 9 1/2 hour car ride from AZ to Fullerton, CA. GRACE made their first headlines and the prime time news. We visited their pediatrician and he confirmed how healthy they are. He even decided he was not going to treat them like "premies", but as normal healthy babies. They continue to grow in weight and length and are enjoying their new home. We appreciate all the volunteers who have come to help take care of them, and we are looking forward to watching them continue to grow!! Here are their current stats as of 10/25/2012! !